Here's a nearly 20 minute chunk of the new Arkham game. Much like the older Arkhams, there are a number of strong themes that permeate the game: grappling, gliding, punching, kicking, and futuristic-x-ray-vision-ing. One of the major differences this time is that the police haven't yet realised that Batman is an excuse to kick back and let someone else do the job for them, meaning he'll be grappling, gliding, punching, kicking, and futuristic-x-ray-vision-ing his way through them, too. 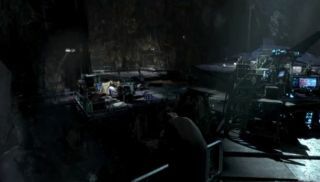 We get a brief look at the Bat Cave, a challenge focused XP system, and a few of the gadgets Batman will be using. Even then, my favourite part of the walkthrough is when one of the developers is explaining how Batman will be less brutal against Gotham's police, as he's violently kicking one of them in the face. When it comes to Gotham's most fist-happy resident, everything is relative. Batman: Arkham Origins is due out on the 25th October.